What first strikes me is the hidden messages put in this lesson, as is so typical of the Seventh-day Adventist denomination. They allude to things and are not up front in mentioning their doctrinal essentials. They downplay their differences in theology from evangelical Christians. Instead of heralding all they deem critical in making them the “remnant church”, they attempt to blend in, confusing those seeking true biblical knowledge. 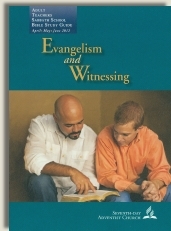 Instead of saying that their evangelism and witnessing needs to encompass Deut. 10:12, 13 (i.e. “the law”, and specifically the 4th commandment), they beat around the bush. This passage is not a call for the New Testament Christian to law/Sabbath-keeping. It seems ironic that Matt. 23:15 is mentioned with the writer reminding us to ”keep the truths of Deut. 10:12, 13 before us”. In the Matthew passage Jesus was warning the Scribes and Pharisees to not be hypocritical legalists (promoting “salvation by works”, and having hardened hearts), therefore making more ‘sons of hell’ such as themselves. The writer throws in the Deuteronomy passage with Matt. 23:15 subtly emphasizing that if one doesn’t keep the 4th commandment in focus, we would be making these new believers ‘sons of hell’! This is exactly what Jesus was warning against—the legalism of adding works (Sabbath/law-keeping) to grace alone! “The hour of His judgment has come” (v.7) refers to the “Investigative Judgment” of 1844. “Worship the Maker of heaven and earth” (v.7) is a call to observe Saturday as the Sabbath. “Babylon the Great has fallen” (v. 8) identifies the Roman Catholic Church as the notorious prostitute who seduces the nations. If anyone worships the beast…and receives a mark on his forehead or hand (v. 9) is a warning against following the antichrist and worshiping on Sunday. Those refusing to heed the warning will be “tormented with fire and sulfur” (vv. 9-10). According to this understanding, only people embracing the SDA message will be saved. Deut. 10:12, 13 is originally given to the Israelites and is not a call for the New Testament Christian to law/Sabbath-keeping. Seventh-day Adventists are not up front in telling others about their core denominational beliefs. They downplay their differences in theology from evangelical Christians. Instead of heralding all they deem critical in making them the “remnant church”, they attempt to blend in, confusing those seeking true biblical knowledge. Matt. 23:15 is used by the writer to emphasize the “truths of Deut. 10:12, 13”, thus subtly linking neglect of the 4th commandment to ‘making more sons of hell’. The references to Rev. 14:6-12 are a way to tie in “The 3 Angels Message” (including Sabbath observance) to a heart that’s right with God. (See above for details on The 3 Angels Message). 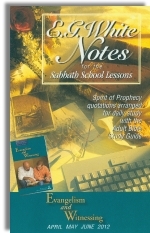 Seventh-day Adventists focus on Old Testament Sabbath-keeping as part of their salvation message, ignoring New Testament scripture and Jesus’ complete atonement on the cross. Seventh-day Adventist doctrine isn’t biblical-- reiterating that it’s a false gospel.